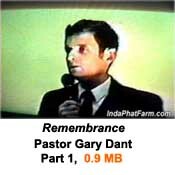 Pastor Gary was a minister for the young people. I don't think I ever heard one of his messages that didn't mention the young people at some point. This was one of his callings, and we will not forget. Yesterday, Pastor Gary passed away in Papua New Guinea. He is survived by his wife, Sister Carolyn, and children, Sandy, Andrew, Sister Cathy, and Billy. 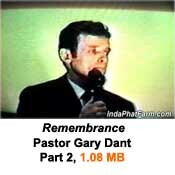 Remembrance: I have 4 Media clips for you of Pastor Gary. This message that he gave a couple of decades ago is still very relevant today. 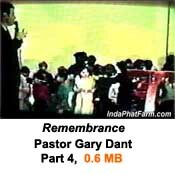 Please be advised that this footage is over 20 years old, and will be somewhat grainy at times. and click "Save Target As"